This post is sponsored by Four Monks Cleaning Vinegar. The opinions and photos expressed are completely my own. 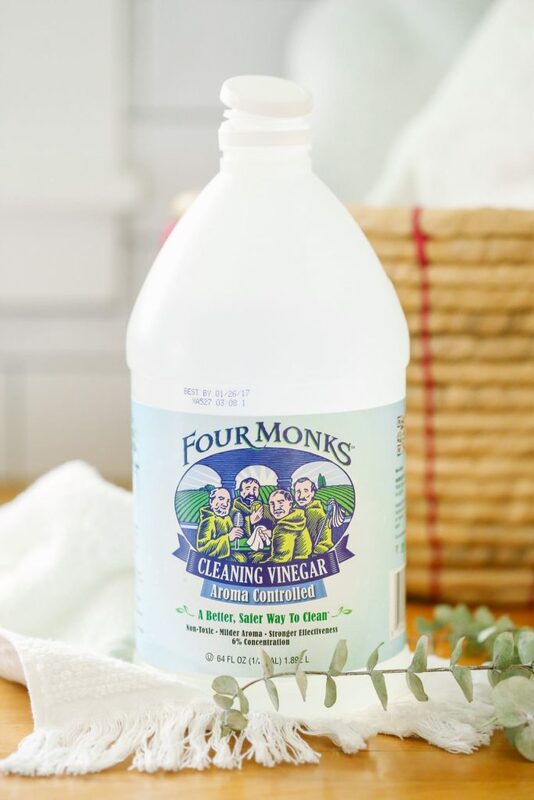 Thank you Four Monks Cleaning Vinegar for helping me get the word out about natural cleaning! No matter who you are, where you live, or how many children you have or don’t have, we all share one common life activity: laundry! Together, we’ve simplified laundry with a colorful towel trick, and developed a practical laundry routine to end the massive mountains of laundry. 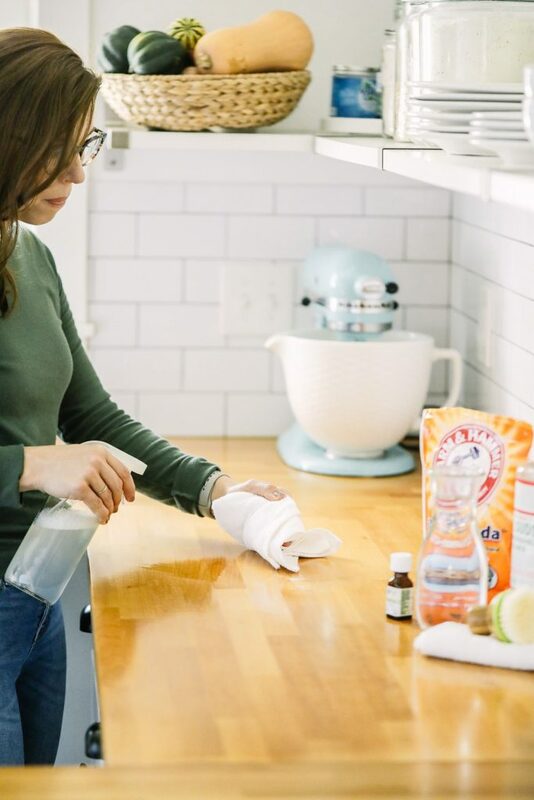 We’ve also tackled the huge task of switching from less-than-desirable laundry products, to laundry products we can feel good about using around our family: homemade laundry soap, dryer balls (dryer sheet alternative), homemade bleach, salt laundry softener and scent booster, and even a powerful stain remover. Basically, when it comes to doing the laundry, we’re Laundry Ninjas. Nothing can stand in our way when it comes to naturally and effortlessly taking on the dirty jeans and stubborn stains. Friend, it’s time we revisit the topic of laundry and tackle this question, because the answer is a big YES! 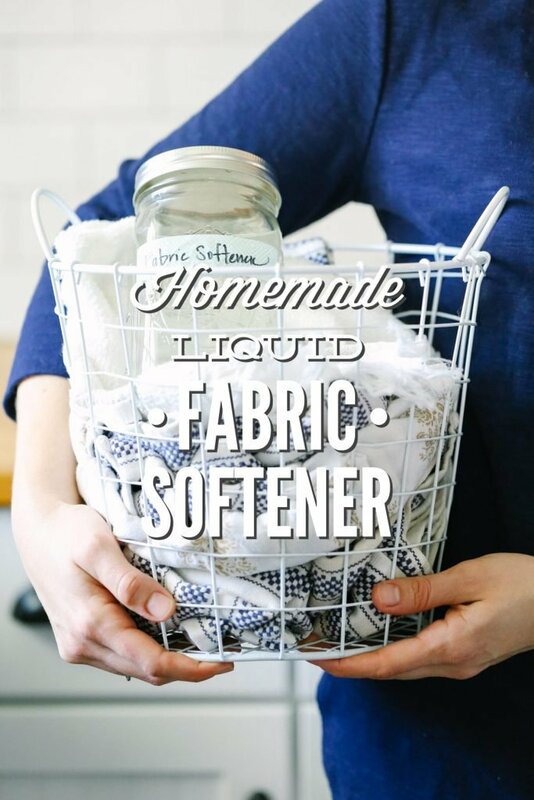 Yes, a natural liquid fabric softener does exist. In fact, the liquid recipe/solution is so simple that I haven’t blogged about it, because it almost seems too simple to share. But as I’m reminded over and over again on this natural journey, simple solutions and recipes are usually the ones that are most often overlooked, and usually the ones that are most worthy of being shared. Even before we made the switch to natural cleaners and beauty products, I never really understood the need for fabric softener. The home we lived in during our first few years of marriage had a water softener, which meant the dishes never came out with spots and the laundry was always perfectly soft. Ah, the glory days! When we moved into our new home a few years ago, I quickly came to realize the importance of a good dishwasher soap and fabric softener. The mineral deposits (which I’ve read are a blend of calcium and magnesium) from the hard water equaled stiff fabrics and spotty dishes. Now, I’m okay with stiff clothes. Really, I can live with stiff jeans, shirts, and socks. No biggie! But the moment our towels started feeling like cardboard versus the divine fluffiness of cotton, I started to seek out natural solutions to complement my homemade laundry soap and dryer balls. 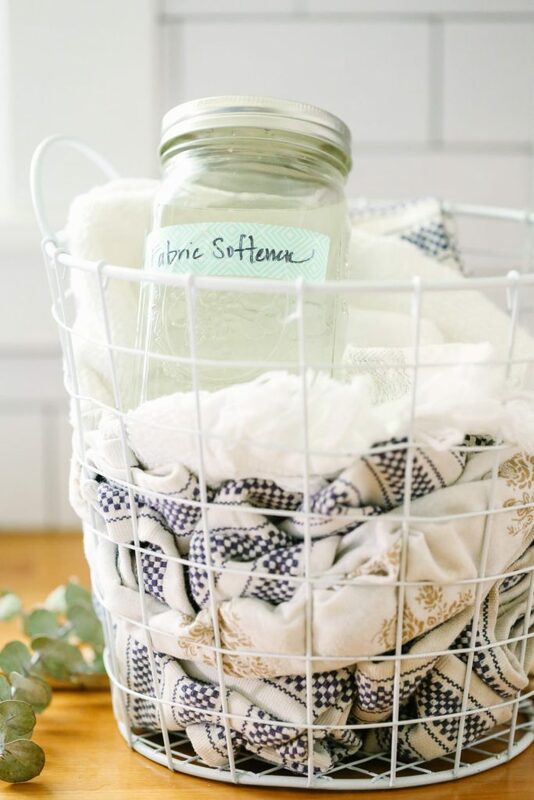 After some research, I discovered two simple, inexpensive, and completely natural fabric softener solutions: salt (a dry solution) and vinegar (a liquid solution). I’ve experimented with both solutions over the years, and I’ve experienced good success with both options. A few months ago, I shared my recipe for a salt fabric softener and scent booster. Now, it’s time to explore the simple liquid version that’s made with nothing other than good ol’ vinegar. Before I share the super simple “recipe,” let’s talk about why vinegar is a good fabric softener. After all, the goal of natural cleaning is to use “better” products that actually get the job done! When vinegar is used as a fabric softener, the acetic acid works to remove mineral deposits or leftover soap buildup left on fabrics. The final result is soft laundry. Hello again fluffy towels! Some sources claim that vinegar helps to retain the color of fabrics. In fact, a few of my “greener” friends swear by washing their jeans in vinegar and water, since laundry soap can speed up the fading process on a good pair of jeans. Now that I’m enjoying a capsule wardrobe, I should probably start heeding their vinegar-washing advice to extend the life of my jeans. 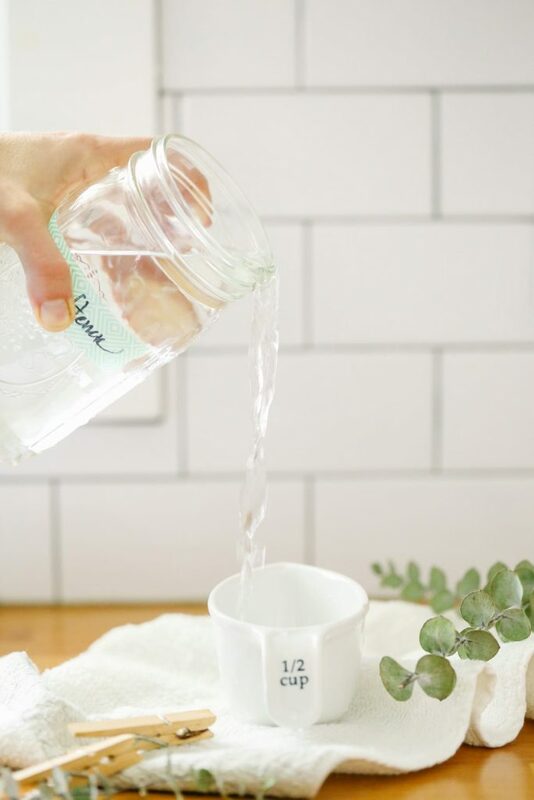 The most effective way to use vinegar as a fabric softener is to add 1/2 a cup during the rinse cycle. That’s it! If you’re like me, then babysitting your washing machine until it finally reaches the rinse cycle isn’t very practical. To solve this problem, I recommend using a fabric softener ball. 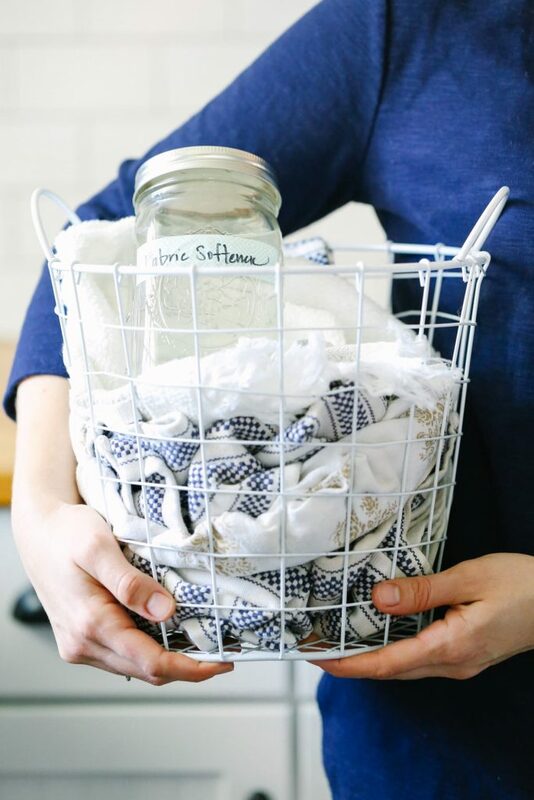 Let’s get started “making” this simple, one-ingredient, natural fabric softener. Your towels (and family) will thank you! 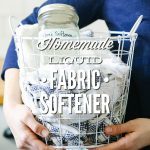 Yes, a natural liquid fabric softener does exist. In fact, the liquid recipe/solution is so simple that I haven’t blogged about it, because it almost seems too simple to share. But as I’m reminded over and over again on this natural journey, simple solutions and recipes are usually the ones that are most often overlooked, and usually the ones that are most worthy of being shared. 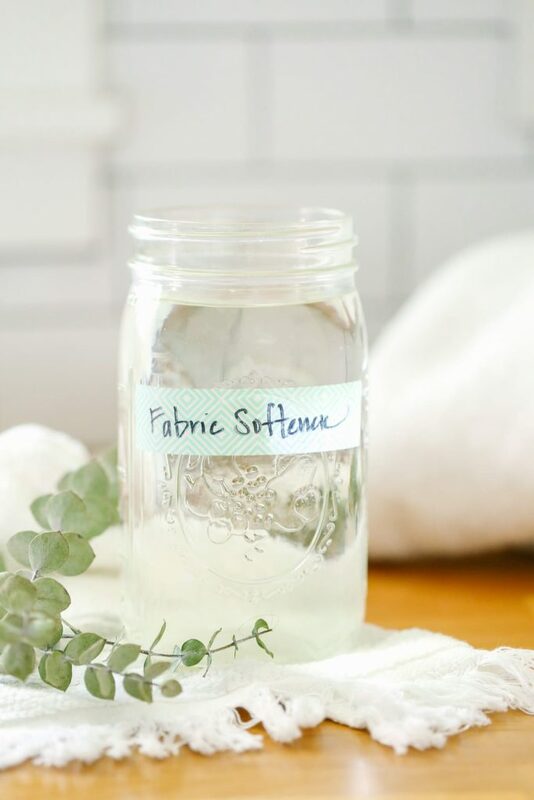 Add the fabric softener to the washing machine during the rinse cycle, or to the fabric softener dispenser, or to a fabric softener ball at the beginning of the wash cycle. The vinegar shouldn’t be added with the laundry soap as this may result in grease stains, especially when using a castile soap based laundry soap (like my homemade soaps). The vinegar shouldn’t leave a vinegar scent on clothes, if it’s added at the beginning of the rinse cycle. Vinegar can actually improve the scent of your laundry by removing mildew odors. If you have extremely hard water, you may need a bit more vinegar per load of laundry. PS: Yes, technically, white vinegar isn’t “homemade” unless, of course, you’re making vinegar at home. But, I think you get the point here…liquid fabric softener can easily be “made” using a basic, natural ingredient. So let’s stick with “homemade” here ;). I like to add vinegar to a prerinse when washing new clothing and after that the colors won’t ever run. I also love the salt softener, it works great. (Oh and I had to use CLR in my washing machine to fix the rust problem.) Just running a rinse cycle after my last load helped keep my washer from rusting again. Thank you for sharing, Bethany! That’s very good to keep in mind! These look great! I’ll definitely have to try these out and see which I like best. Which one would you say leaves clothes smelling the freshest? Hey Jordan, Both work equally well in the scent department :). Can you combine this with the salt fabric softener and scent booster for double impact? Hey Helen, I haven’t tried combining the two, but chemically-speaking I believe you can. Salt and vinegar are friends (unlike baking soda and vinegar ;)). If you try it, let me know how it goes! Perfect, Melody! I’m glad the information was helpful! I would love to hear what you think of the homemade solutions :). Can you combine this with the salt based fabric softener and scent booster? Why does the washing machine rust with this method? Hey Mary, I personally haven’t experienced this issue, but my guess is that with smaller loads or HE washers (using much less water) if the vinegar sits on the walls of the machine for an extended period of time, it could possibly rust the metal. Haven’t had a chance to try this yet but was wondering if vinegar balls could be made … like fleeced wood balls soaked in vinegar? Any ideas? Hey Heidi, I just realized that I missed your comment…I apologize. That may work. Another option is to soak rags or washcloths in the vinegar, then toss a sheet in the dryer. Thank you for the softener recipe with salt, My question is, if you use kosher salt, do you leave it in the large pieces? or do you /can you grind it into an almost course powder? It might make it so you wouldn’t have to use so much? Hey Don, I use the salt “as-is.” You may be able to use fine table salt. I’ve really enjoyed reading your story and tips to live simply and trying some of them. Sooo, how do you add the vinegar to a front load washer. My husband can’t stand the smell of vinegar, so I’m a little concerned about using it & don’t know how I could use the salt method for softening in the front load washer. Thanks for all the effort you put in to your blog. Hey Ellen, I totally understand the vinegar issue. I’m not a huge fan of the smell either, but luckily when it’s used for a laundry softener, the odor disappears. We just got a new washing machine, and in my machine there’s a little compartment for “laundry softener.” That’s where I’ve been adding it, when needed. I wonder if you could also use a Downey Ball? why would the vinegar cause grease stains? Hey Diana, If you’re using a castile soap-based laundry soap, the vinegar will result in unsaponified soap, which may result in grease stains on garments. I used vinegar for a while but my sheets developed light spots, like bleach can do. Anyone else experience this? I loved the vinegar before that happened. I have a front loader, don’t know if that has anything to do with it…. Hey, Cat. I wonder if the vinegar was reacting with another product in the wash. What kind of soap/detergent was being used with the vinegar?